The panel hosted by the Zionist Council of Victoria and the Zionist Federation of Australia was made up of international experts, Dr David Bernstein (Dean of Pardes Institute, Jerusalem), Dr David Breakstone (Deputy Chairman, World Zionist Organisation) and Sarah Mali (Director of Machon and Leadership Project at Jewish Agency for Israel). Moderated by Zionist Council of Victoria board member, Liora Miller, the evening attempted to put context and understanding around the age old question. Dr Breakstone, in his opening comments said that the rise of anti-Semitism and anti-Zionism is perhaps our own fault as we call Israel the nation of Jews, therefore we as Jews are seen as responsible for everything Israel does and are held accountable as such. Dr Bernstein said that anti Zionism is politically correct way of describing the world’s oldest hatred and that it was very difficult to differentiate between anti-Zionism and anti-Semitism. 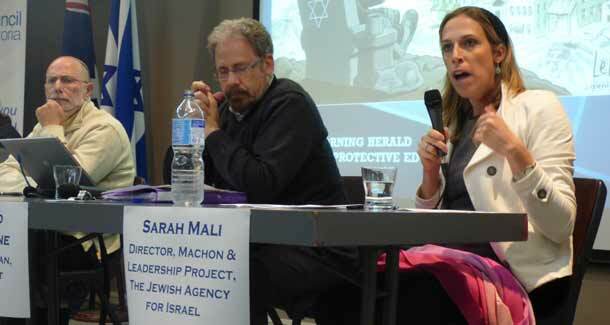 Sarah Mali’s expanded on the concept of anti -Zionism as the new vehicle for anti-Semitism, likening anti-Zionism to a mutation of a larger virus called anti-Semitism. She stressed the importance of distinguishing between legitimate criticism of Israel and blatant anti-Semitism, citing the 3D test as a useful resource. She explained how demonization, double standards and delegitimisation are all factors used in arguments about Israel that are in fact not simply anti-Zionist, but anti-Semitic. The discussion was open to the floor and community engagement was encouraged. One of the key issues raised by the community was that of disaffected or disengaged Jewish youth, and the propensity of younger people to consider “Jewish” and “Israel” as separate entities.